Toxic Fox are four young lads on a mission. Made up of Zephyr Jenkins (Vocals), Matt Buchanan (Guitar) Richard Hall (Bass) and Jack Bradburn (Drums) they possess an obvious passion for the music. With a get-rocking-or-die-trying attitude to their career aspirations, they’re set for a killer year in 2019. Hailing from the Sunshine Coast, their sound combines elements of surf rock with mellow ska/reggae indie beats. 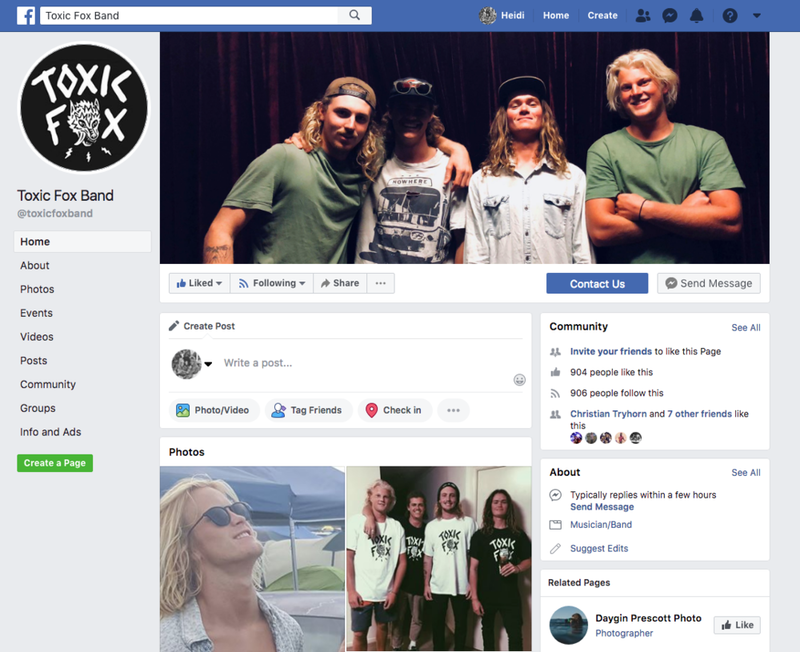 They represent the quintessential laid back vibes of their QLD home region, with a killer punch of energy, as demonstrated in their live shows at Solbar, Noosa Surf Festival, Rics Bar, The Zoo and The V Room. Their most recent acoustic single ‘10 years’ was a turning point in the bands notoriety, gaining popularity across social media platforms for the band and demonstrating a maturity beyond their years. At the beginning of 2018 they enjoyed seeing their single ‘Creature’ featured on Tai Jennison’s surf film ‘Bloom’, featuring Taj Burrow and Brent Dorrington. The band came together in 2017 and have been working hard on putting together a selection of new tracks to be released this year. In February they take to the studio at Rocking Horse near Byron Bay to record what looks to be a notably matured progression of their sound. The up and coming new single ‘Oil Painted Hill’ is currently in the works, with filming set in the coming month and a tour of the East Coast planned later in the year.